Now that the brakes have been put on tax season I can finally write my Popsugar Must Have April review! Let’s start with my first impression of the box while I was at the mailbox; my exact words were “boy this is light! ?” Then I hmmm’d all the way across the street wondering what could possibly be inside and it be so light. 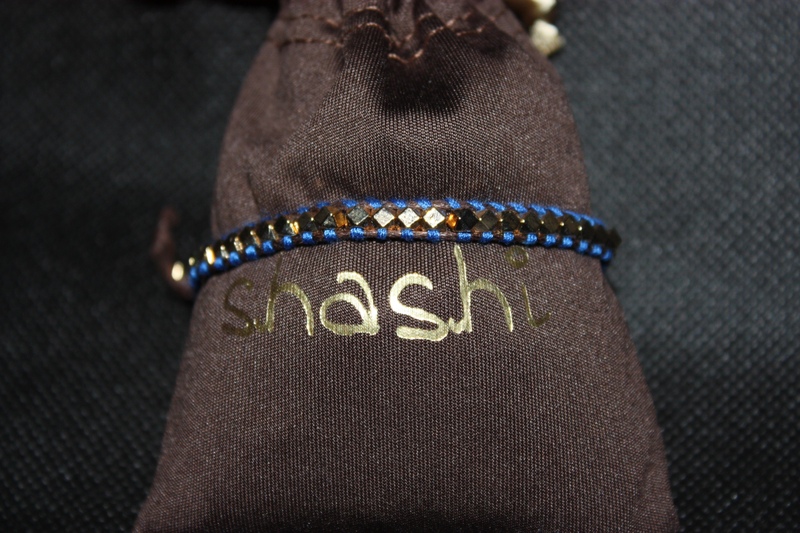 First up the Shashi Nugget Bracelet in Turquoise/Blue. This is a gold plated beaded bracelet that adjusts to your wrist by pulling the strings in the back. Because there is no clasp on this bracelet it can be adjusted to fit different sized wrists, which I think is a good idea, the downside is that it was too small for me even made at its largest. It seems to me that it is made on the small scale, there was no way it was going over my hand no matter how I adjusted it. The quality seems to be good, I didn’t see any major flaws in craftsmanship. It doesn’t lay in a perfect circle right out of the bag, but it looks like if you put it on your wrist; or if you are me a blown up baggie, it lays flatter and more like a traditional bracelet. I think that it is possible over time it could wear out if you wore it a lot because the string looks to be embroidery string and I know that eventually it breaks down when used as bracelets. It would look cute layered with other small bracelets especially since we are hitting the summer months and our sleeves get shorter. I plan on giving this to a friend because I think it would fit her and it seems more her style than mine and I would hate for it to go to waste just sitting on my dresser. Next up is the Kai Perfume Oil. This is a roller ball perfume oil, because it is an oil you should be able to use less and get the same effect as your spray perfume. But for me the scent is too floral, as I write this I haven’t put it on my skin yet to try, mainly because I was scared I would have to deal with the floral scent all day and I wasn’t really in the mood for that over the weekend. I plan to wear it this week sometime while I am at work and see how it goes. Worst case scenario I can wash it off when I get to the office. It does say that it will smell differently on each person, which is true for all perfumes. My one hope is that the gardenia smell it gives off right out of the bottle be a lot tamer on the skin and it will just have this light floral scent, which for spring and summer would be nice. I will update on twitter how it works out for me; so be sure to follow to stay updated! I do like the idea of the roller ball because this is something that I could easily travel with or throw in my desk drawer and not have to worry about it leaking everywhere so that is one plus for it! 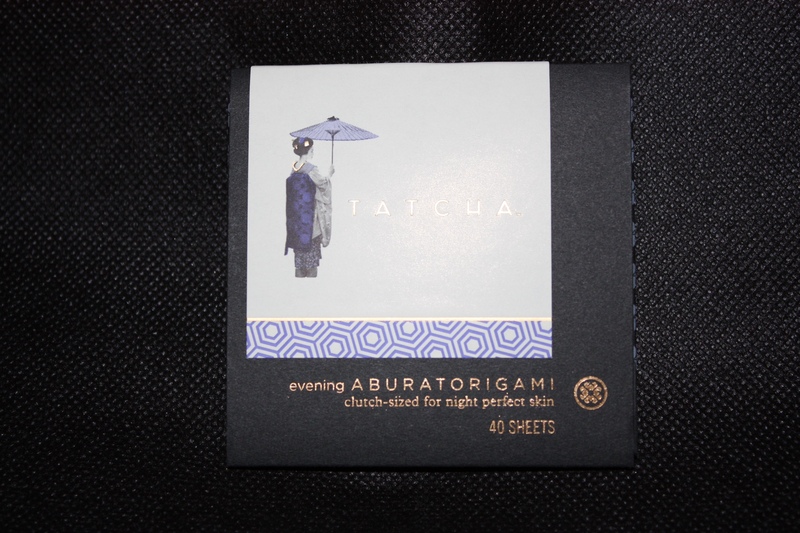 I was a little disappointed to see this in the box because back in the August box we received the original Aburatorigami papers. I didn’t use them then and I wont be using these now. For me I don’t have oily skin, so I just do not use blotting papers. I also know that it isn’t all about oily skin it is just that my beauty routine starts and ends in the morning. I rarely reapply makeup throughout the day and in all honesty rarely check up on it unless I am going out after work, and even then I rarely have makeup with me to reapply. So it just doesn’t seem practical for my day to day life. Now the papers in this months box are for evening, they are black with gold flakes in them and come in a smaller size than the original. I do see that they could easily fit in your clutch and you can go about your evening then when you go to the restroom you could break them out to freshen up. Maybe if I think about it I will put them in my bag the next time I go out because it does seem to be the time of year where a lot of events happen outside at night and it can get warm so maybe this will help to keep things in place. I just have to remember I have them and to throw them in my bag. I did a side by side photo of the chocolate bar from Alter Eco because when I decided to give them a bite I wanted you to see what I opened. Well tried to open, it took some time to get the wrapper off the chocolate because it melted at some point on its way to me. In the picture on the right you can see how the left side of the bad has turned a pale brown and the far left side it is actually completely flat and just powder, when the bar melted it was on its side so the right side is solid while the left isn’t. I did take a bite just because I wanted to see what it tasted like and it was decent; I do think if it made it to me unmelted it would’ve been a decent bar of chocolate. I do wish it had been milk chocolate instead of dark because I prefer that but when I am not eating it any way I guess it really doesn’t matter. They did include a $1 off coupon for one of their products, not sure I will use it because I find $4 for a chocolate bar a lot of money but who knows if it goes on sale or something maybe I will give it another shot. 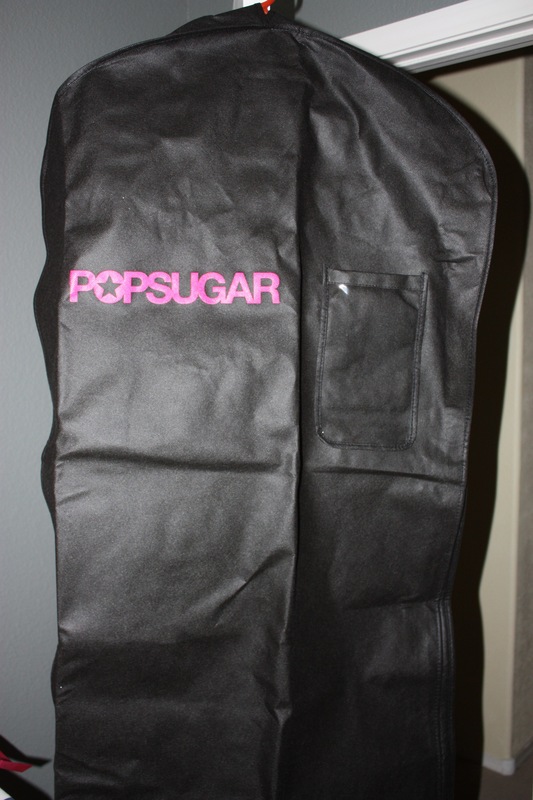 This item took up 90% of the box, it is a large 4 in 1 garment bag. The idea behind it is that you put your dry cleaning in the bag, take it to the cleaners then instead of the cleaners putting that clear plastic bag over your items they put this bag over it instead. A way to cut back on the plastic bags being used. While I like this idea, I am not sure how well executed this would be, I could just see them putting this on the hanger with your clothes covered in their clear bags just like they do with current dry cleaning bags or it get put on someone else’s dry cleaning. It would be nice to see dry cleaners offer these bags for sale so that maybe it would become standard but in reality that just hasn’t happened yet. It also says that you can use it as a laundry bag (if you have the stand or hook), duffel and of course just a plain garment bag for travel. This is something I think I may see if my parents would like because they go to the dry cleaners on a pretty regular basis and maybe could get some use out of it, I just know it is going to take up space in my closet and never get used. Especially since I have maybe 3 dry cleaning pieces and I always just try to sneak them into my parent’s weekly trip. Here is the breakdown on the suggested retail cost of the items my overall review will be below the breakdown. You can click on each of the names and be taken to their corresponding website if you are interested in any of the products I received. My overall feel of this box is disappointment. 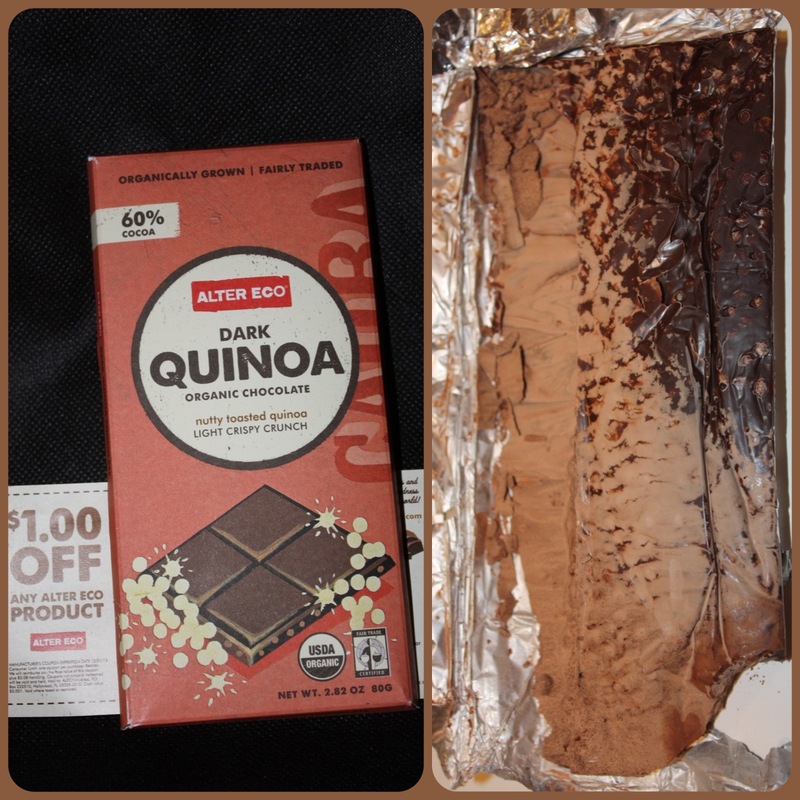 I really wasn’t wowed by any product or super excited to try anything except the chocolate bar; which turned out to be inedible. For $35 a month it is hard to see the value with this box. And since this isn’t the first disappointing box my immediate response to everything was to cancel my subscription. I really almost cancelled that very night because it just feels like they are not doing what they said they would do. It should be must have products for life, home, beauty & fashion. Nothing seemed like a must have, it all seemed pretty standard especially when they reuse a product. If you were going to include a product from Tatcha again why not choose something different, like their Hydrating Mist or Lifting Mask so that we could see something else from their line, this would have made more sense to me then just putting in another blotting paper pack. It just felt like they were trying to make the $100 value mark and didn’t care how they did it. Because I didn’t cancel that very night a couple days later I got an e-mail telling me that they were running a contest in May’s box where as a subscriber they are going to be picking 10 winners of a clutch handbag. Since I am sucker for handbags I have decided to try my luck and keep my box through May, but after that one my ultimate choice is to cancel. I just don’t think they are living up to their promises so I may switch to another box that is out there. If you know of a monthly subscription that I should try please leave me a comment and I will look into it!